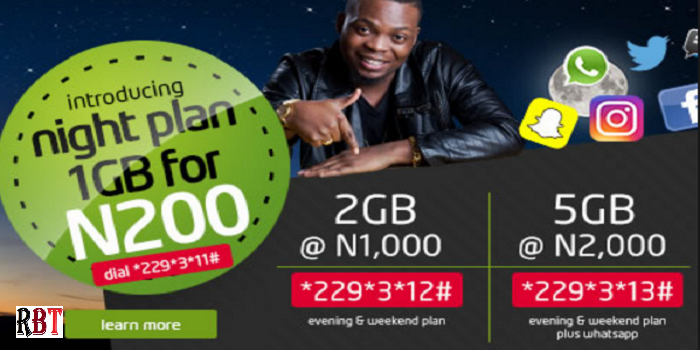 Etisalat Data Plan for evening, night and weekend has been introduced. With Nigeria telcos battling for customers attention, who offers the best night plan is been sought after. Globacom nicknamed his night and weekend plan as Glo TGIF, Airtel’s match is smartTRYBE, the Yellow network has its night plan and MTN WOW Weekend combo to boast of, and now the easyblaze network has joined to make night and weekend data plans more competitive. Coming few days after Etisalat 4G LTE Network went live in Lagos, the Etisalat Data Plan for evening, night and weekend is available to all Etisalat Nigeria prepaid customers. Unlike others, it the only network giving an evening, fast and stable broadband service for subscribers to enjoy a richer online experience at their favorite sites. The newly introduced Etisalat Data Plan for evening, night and weekend seems to be a tad costly especially now everyone is looking for the best way to manage the economy. When MTN released a reviewed data bundle plan some few days ago, it didn’t get people smiling like when Glo unveiled theirs. But I’m certain that of Etisalat won’t collect your MB without you using it like others. Subscribers to these plans should note that please note that auto-renewal and data rollover apply, however, to stop auto-renewal, dial *229*0#. Moreover, bundles are not applicable while roaming. To know more about Etisalat Data Plan for evening, night and weekend, dial 229. If you are wondering if this package is available to Etisalat 4G service, you are not wrong. All you have to do as an Etisalat subscriber is to simply turn on your 4G-enabled device and you are on. This means you don’t have to get an extra 4G LTE Sim card like what MTN and Glo are asking their customers to do. NEPA has done the usual! Here you go! The new Etisalat evening, night, and weekend data plan maybe costly, but seems to worth it. Have you tried it lately? What is your opinion about these new Etisalat subcription plans? let us know using the comment box below!